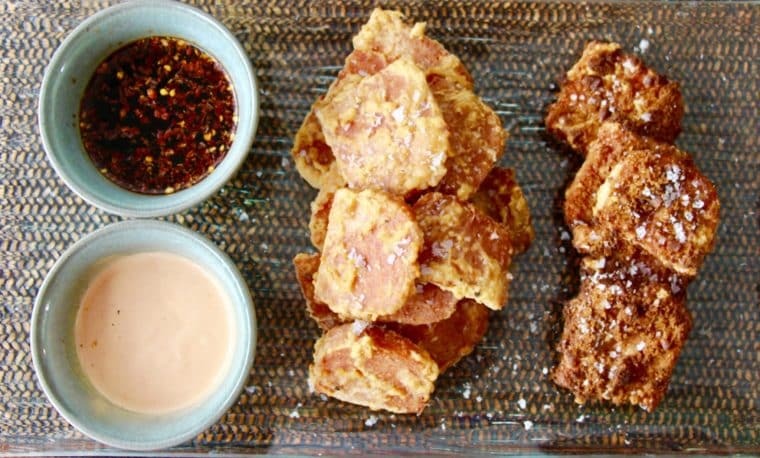 Deep Fried Spam with Dips | Is Life a Recipe? I have had this dish a number of times at restaurants across Singapore. Today it was my turn to make this dish. I think I did a bloody good job of my Deep Fried Spam with Dips. It really is very simple too make, even with the little spin on one version. Read on. Personally I think that would stand up in any restaurant as a bloody fine looking dish! The kids love Spam too, because it salty. But could they imagine it covered in batter and deep fried? HEAVEN. My Deep Fried Spam with Dips, are surely that! Folks here we go with how to make this cracking little beer snack dish above, my Deep Fried Spam with Dips. Firstly let’s get the dips done. A good squeeze of half a lemon. Now to the deep fried spam itself – we need that for Deep Fried Spam with Dips right? It’s so simple, but I’ll even A,B,C it for you. #3 = 5-6 finely crushed Digestive biscuits (0r other biscuit). Fry these bad boys off until golden brown – done!!! Pop these on to some kitchen paper to drain off the excess oil, and serve with the dips. Incredible little dish. Oh yes and just one thing folks it is absolutely MANDATORY to serve a beer with my Deep Fried Spam with Dips – ENJOY!!! No Replies to "Deep Fried Spam with Dips"